Mach 1 has made a significant difference in my son’s pitching performance. From the comprehensive, high tech analysis of his arm strength, flexibility and core strength to the one on one personal attention he gets from trainers and former college/ pro players, this off season program has taken my son’s pitching skills to the next level. On top of it all the guys coaching Mach 1 make it fun. It’s definitely a 1st class pitching program for guys who want to take pitching in high school and beyond seriously. I want to thank you for the putting the Mach 1 program together, Jacob has learned a lot and we appreciate everything you have done for him. Jacob originally signed up for 3 months not knowing if he would be able to continue the program beyond that. With Basketball starting up and his team baseball practice we just won’t have enough time to put into the Mach 1 program too. Jacob enjoys playing Basketball and was unsure if he would play again this year or not. He is going to continue working in the All star gym and doing different workout classes to keep up with improvement. I hope you are able to continue the program next year, as we will be signing up. Hopefully Jacob can get a few of his teammates to bring along with him also. Just wanted to drop you a quick note to say thank you for all of the work you have done with Max. 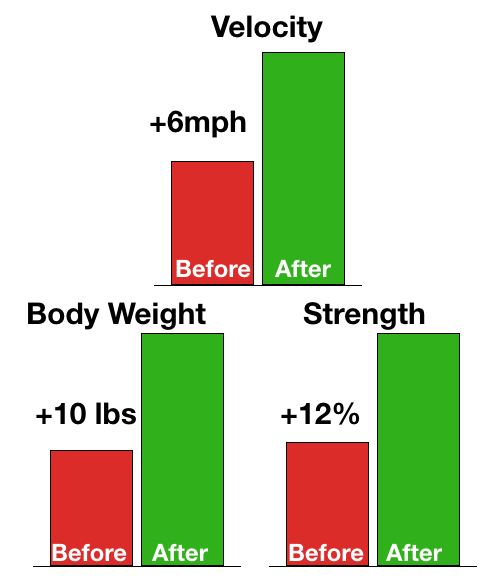 We have been really happy with the Mach 1 program and the gains Max has seen. As someone who played at a D-1 level myself, I have always been very protective of who I let coach my son. We have done other programs including personal instruction and some have come up a little short when it comes to teaching the fundamentals and providing direction on how to do things the right way. 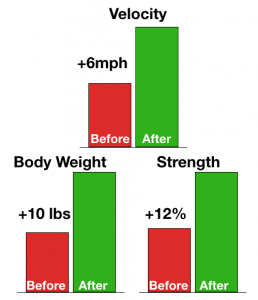 I feel It is one thing to work on increasing your velocity and to see gains, but if you are also not learning the proper mechanics at the same time, your body may not be prepared to handle the increases and it may lead to injury down the road. As a 12/13 yr old, learning proper mechanics was an important consideration when looking at training for my son. I have been amazed at the personal attention Max has received all the way through the program. From the bullpens, to arm care, to weight training, there is always someone from your team with him to make sure he is doing things the right way. It is also great to see the latest tools such as video, rapsodo, velocity belts etc, being used to analysis and improve performance. Thanks again to you, Andy and the rest of the team. Hey, we just finished up a very successful day on the mound today! He pitched the championship game today in KC., pitched 5 full innings at 99 pitches. I think that is a lot but he was doing well and feeling good. I wanted to say Thank you to you and your staff! He is stronger, confident and more knowledgeable about his pitching! Amazing!! We were so proud of him .. all his hard work over the winter and spring really is paying off for him. Hey coach I just got done with my Quincy visit and I actually received my first offer. I want to thank you for all the work you have done with me so far. I will see you on Monday and give you a recap on the rest of my visits. I started out consistently throwing 78-79, topping out at 80. Just 3-4 weeks in I am already throwing 81-82 consistently and topping out at 83-84. Other things I can’t put into statistics, but have improved greatly on: location, mindset, and technique/form. I started at 155 now up to 165! I just wanted to take the time and provide some feedback from a parent’s perspective in regards to the Mach 1 Program. My wife and I are very pleased with the results we have seen thus far and appreciate the work the coaching staff has put in. Ricky was part of the initial group to start with the program back in August. Prior to starting the program, the last event Ricky participated in (that actually captured any measurements) was an Under Armor Baseball Factory College Prep Workout. Since then, his primary workout has been with the program. He has had to do some running and weight lifting with his gym class, but not much at all. During the 1st segment, Ricky’s workout consisted of 2-Bullpens, 2 – 3 Weight Training, 2 Arm Care and 1 Speed or Agility class (which was alternated each week) per week. For the most part, he was at All Star 4 times per week. After we saw Coach Whiteside’s email about the transition into the Power Phase, Ricky increased his workload by 1 extra Weight Training Session (3 – 4 per week) and started doing a Speed and Agility class each week. The one downside to everything is that Ricky battled through being sick shortly before the re-assessment and lost some of the body weight he had gained. Had he not had to deal with the sickness, his gains may have been a little bit higher. While the primary focus is for pitching, he also got an added bonus with an increased Exit Velocity. His 60 yard dash numbers did not show an improvement, but we also didn’t focus on simply making him faster. What these numbers don’t show is the immeasurable stats…such as confidence, control, pitch movement. Ricky looked like a different pitcher on the mound in Florida. He was able to throw all his pitches for strikes, was able to spot his fastball very well, and regardless of the situation (runners on, unfavorable count) he didn’t solely rely on his fastball. He was able to generate a lot of swing and misses, as well as pound the zone with strikes. Sam made the Marquette JV as of last Friday!!! Your staff did a fantastic job helping him over the past 3 months. Pete, Andy and Evan were very instrumental in building a positive attitude, strength, velocity, adding new pitches and overall confidence in his ability! Just wanted to drop a quick note to tell you this is the most well run program we have seen and been a part of! I also wanted to know when the earliest Aiden could enroll in the program next year would be. He and I both love the program and definitely want to continue with it, only we want to start at the beginning, not in November if possible. Cameron is really enjoying working at Mach1. Last week he was there on Wed. from 8-9pm, and all three coaches were watching every detail and giving him a hard time, even brought up his big toe position, stuff like that. He had so much fun and was really trying to prove himself. Instead of touching 65-66, he threw a bunch up there, including six in a row. And then they challenged him to really give it his all and push down with that back leg, and next pitch was 71.7mph. Cam and all three coaches were bouncing around, it was awesome! When he got home and gave my wife the details pitch by pitch. He is loving every single thing about coming over. My wife and I could not be more excited for him, and more thankful to you and all the coaches.